As an alternative reading of anime’s global consumption, this paper will explore the multiple layers of transnationality in anime: how the dispersal of agency in anime production extends to transnational production, and how these elements of anime’s transnationality are engaged with in the transnational consumption of anime. 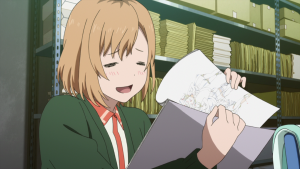 This will be done through an analysis of Shirobako (an anime about making anime), revealing how the series depicts anime production as a constant process of negotiation involving a large number of actors, each having tangible effects on the final product: human actors (directors, animators, and production assistants), the media-mix (publishing houses and manga authors), and the anime media-form itself. 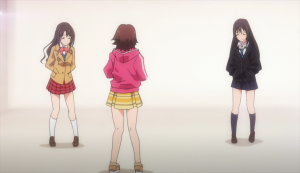 Anime production thus operates as a network of actors whose agency is dispersed across a chain of hierarchies, and though unacknowledged by Shirobako, often occurs transnationally, making attribution of a single actor as the agent who addresses Japan (or the world) difficult to sustain. Lastly, I will examine how transnational sakuga-fans tend to focus on anime’s media-form as opposed to “Japaneseness”, practicing an alternative type of consumption that engages with a sense of dispersed agency and the labor involved in animation, even examining non-Japanese animators, and thus anime’s multilayered transnationality. If animation allows us to envision a world of active objects through animating their movement, then surely how the objects are made to move through the animation changes how they are constituted as actors. In other words, how bodies move in animation, human and object alike, also entails certain conceptions of ” self ” as it is constituted through the dynamics of its animation. This study aims to (re) consider Donald Crafton’s conceptualization of animation performance forms (embodied and figurative performance), specifically in relation to Japanese anime. In embodied acting, the expression of character is produced through distinctive movements, where characters are constituted as individuals, each with their own discrete inside and outside. Figurative acting, on the other hand, utilizes various gestures and codified expressions. Due to this reliance on codified expressions, figurative performances build from previous ones, replaying and reiterating them in different contexts. Each of these forms enacts a different conception of selfhood: embodied acting performing the modern conception of individualism bound to the singular body on the object which performs the movement; figurative acting performing a type of “particularity” entailing a different conception of the strict internal/external borders of ” individuality, ” where the self is a composite configured through the citation of codes. Figurative performance thus facilitates an aesthetic well attuned to the contemporary performance of self under the conditions of neoliberalism, selecting from a vast array of options, jerkily moved from one product and expression to another. Anime is a globally prominent media-form with a multitude of styles, yet it maintains a relative uniformity to sustain a recognizable identity as a particular category of media. The performance of the recognizably “anime-esque” is what distinguishes anime as a type of animation, allowing it to be sold and consumed as “anime.” Anime, and its recognizable identity, are performatively constituted by a series of anime-esque acts executed in animation, citing a system/database of conventionalized models in each iteration. What we recognize as “anime proper” are not just “animations from Japan,” but animations that perform large quantities of anime-esque acts. However, anime must continuously work through the problematic of maintaining its identity without redundancy, each performance working through the tensions of diversity and uniformity: in straying too far from a conventional model, it loses anime-esque recognizability and cannot be sold/consumed as anime. As such, anime’s identity negotiates the dynamic divisions between uniformity, repetition, and the global on the one hand, and diversity, variation, and the local on the other. Working through this problematic entails a different type of creativity as combinations of citations from conventional models in each performance negotiates that particular anime’s identity as an anime production and its distinction from other anime. Anime’s problematic is not only invoked through the engagement of conventionalized models of character design and narrative, but also in the technical processes/materiality of animation, which cite character models and conventionalized acting expressions when animated. Yet it is not just the material limits of the medium of animation, there is another limit in the performance of anime in the act of citation that facilitates the doing (and selling) of anime: in the repeated acts of the anime-esque, in the serialization of anime as a media-form, the contours of anime’s formal system becomes a factor of convergence. While anime studies has flourished in the past few years, in many respects manga studies is much more developed, with a longer history and more debates within the field. Because anime and manga are intimately intertwined media, one might ask what models anime studies could borrow to expand the field. But, as there are significant differences between the two media, there will be points where the theoretical models overlap or deviate, specifically in regards to their inter-related yet media-specific aesthetics. This paper focuses on some of these points, specifically the apparent unity of manga and anime’s conventionalized aesthetics, the material distinctions in the respective media, and the variant degrees of globality. In TV anime series, narrative and character, among other elements, tend to be highly conventionalized. These conventions are a significant part of how anime is produced, recognized as anime, and interpreted. It is through the performance of these conventions that anime articulates its identity. In this study, I analyze how anime’s conventionalized patterns are performed within the context of shifting tensions between the local and global. 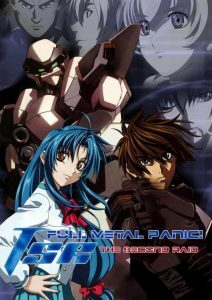 This will be explored through an examination of Full Metal Panic! The Second Raid (TSR: 2005), an anime historically situated during the peak of anime’s exportation boom and the JSDF’s deployment to Iraq (2004-06), and which can be read as thinking through identity, globalization, and military narratives. 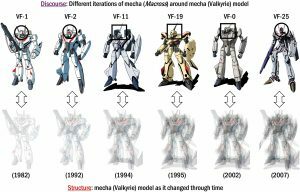 I examine how TSR performs anime’s established conventional patterns in a manner that questions the logic of those conventions, engaging with the anxieties of expanded exportation of a previously local, niche product suddenly exported on a global scale with government backing, and the contemporaneous media discourse on the expanded militarization of Japan. The identity crisis of the main character, Sousuke, acting as the core, conventionalized plot of the series, will be analyzed in relation to the identity of anime itself. Through Sousuke’s identity crisis TSR raises questions about anime’s conventional logic (the narrative and character conventions that appear commonplace), and their connections to the ethics of using lethal force (even in defense), problematizing conventional anime narrative structures and military narratives in general. 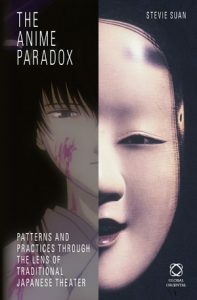 The Anime Paradox: Patterns and Practices through the Lens of Traditional Japanese Theater is an examination of the form of Anime—the repeated visual, aural, and narrative conventions performed in Anime texts—exposed through a comparison with the viewing modes and formal conventions of Asian theaters, primarily Noh, Bunraku, and Kabuki. This is not to push for a “cultural” reading of Anime, to construct a “Japanese” lineage between Anime and Japanese traditional theater. Rather, it is an attempt to consider different means of approaching Anime, providing ways yet unexplored of how Anime create meaning in their texts, and how they (consciously and unconsciously) distance themselves from other types of animation, even in Japan (e.g. Sazae-san versus Evangelion), through the repeated performance of Anime’s established conventions. Instead of looking to Manga or film or other mass-produced texts, this project looks to the theater, often overlooked multi-media productions that possess viewing modes and reading styles that can provide alternative methods for readings of Anime. Anime has become a site of various significant discourses (locally and globally), but before we determine what this performance is saying, we need to consider, on a very basic level, how it is saying it and explore various means of examining it; we need to reflect on the means of expression in the performance of the Anime form, often a crucial point of aesthetic attraction itself: Anime sells locally and globally because it exhibits itself as distinctly “Anime.” The Anime Paradox is thus an effort to provide an accessible discussion on Anime form and the mechanics of the type beauty represented through it from the standpoint of a critic and long-time viewer of Anime. This examination through comparison also works in the other direction, further endeavoring to enrich our understanding of theater through Anime.